Something big is in store for the Lope Shop. “We’re going from 1,800 square feet to 9,500 square feet. 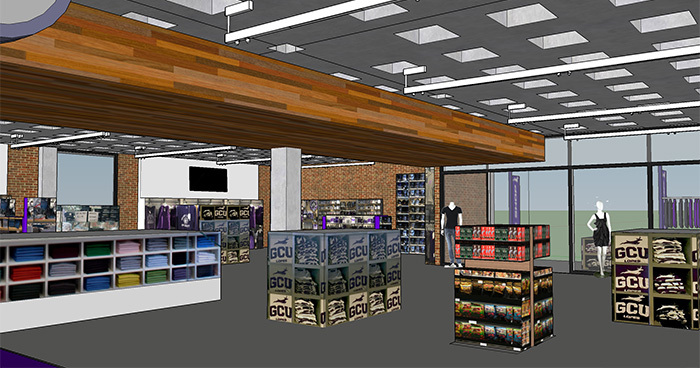 That’s five times the size – we’re quintupling the size,” said Director of Campus Retail and Licensing Andy Dunn of Grand Canyon University‘s Lope Shop, which is making its move this summer from its space on Lopes Way, its digs for the past three years, to the Fleming Building. Assistant Director of Campus Retail and Licensing Shelly Schrimpf and Director of Campus Retail and Licensing Andy Dunn check out the progress of the store’s move into the old College of Doctoral Studies. Some of the structure’s brickwork will make way for glass display windows. That means quintupling the offerings for those who bleed purple. In short, shoppers can expect more: a technology department, a boutique, a permanent alumni and family section, “college of” areas (corners of the store dedicated to specific colleges) and a women’s fashion section catered to staff and faculty. It’s in the tech department where students might find the latest computer, mouse or flash drive. “We’re adding a boutique – late at night, if girls run out of mascara, they won’t have to run off campus to the store,” said Shelly Schrimpf, Assistant Director of Campus Retail and Licensing. Beyond mascara, a separate women’s fashion section will carry upscale fashion items. Expect a gift area, too, everything from bookmarks to greeting cards and toys. And then there’s the Nike concept store: 400 to 500 square feet dedicated to products from Nike, of which GCU is a partner. Look for dedicated areas, too, for some of the other retailers that are GCU partners, such as Champion and Under Armour. Increasing that space also means increasing the number of employees. Schrimpf said the staff will grow from 21 to 50, all of whom already have been hired. 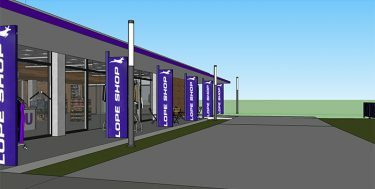 The Lope Shop move comes as the University was looking to add one more food retailer to Lopes Way to join Chick-fil-A, Subway, Panda Express, Auntie Anne’s, and Jamba Juice. 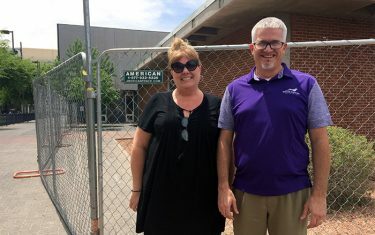 A yet-to-be-named eatery will take over the Lope Shop space, while the shop moves to its bigger home next to the College of Education and across the Promenade from the Natural Sciences building – a space that brings it closer to GCU Arena and the campus’ main entrance on 33rd and Camelback Road. It’s a prime location for the retail space – one Dunn and Schrimpf are more than pleased with. 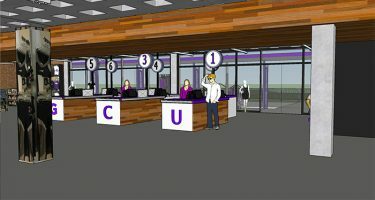 The original store, called the GCU Bookstore, was located in the former Building 26 before that structure and Building 9 next to it were demolished to create space for GCU Stadium. The management of the bookstore was outsourced before the administration decided that it wanted GCU to operate the store itself and moved it to its spot on Lopes Way in August 2015. In making this move into Fleming Hall – one of the few remaining older buildings on campus – it was important to those involved to make sure the new space will honor that heritage while at the same time bringing a modern sensibility to the design. The design aesthetic, by suoLL Architects, keeps some of the current old-school brown brickwork that’s there now. But much of the masonry will make way for full-height glass display windows. Visitors on the northeast side of the building will see not only those glass display windows but backlit signage, a 10-foot-wide light sandblasted ground concrete sidewalk and a metal deck shade canopy. “So as you’re walking toward the arena, you’re going to be able to see the nice, open area,” Dunn said. Speaking of the Arena, Dunn said the Lope Team Shop will remain but will continue to focus more on sports-related items. An interesting feature that the new store will keep is the industrial clock on the side of the building facing the promenade. “It’s a salute to our heritage,” Dunn said. The store also will incorporate some old photos of the championship 1960 basketball team that were discovered during the move. The Fleming Building was named for William and Bessie Fleming, who donated to the university over several decades. The structure was opened in 1963. 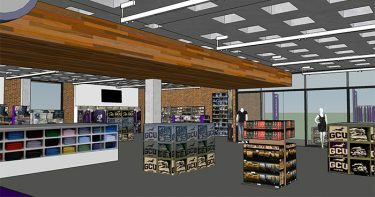 The Lope Team Shop in GCU Arena will remain and will continue to focus on athletic wear and sports related items. The Fleming Building already has been fenced off, and asbestos abatement is set to begin, leading up to the redo, by Pono Construction. In the meantime, it won’t be much of a summer break for Dunn, Shrimpf and the rest of the Lope Shop employees. “Summer is always the time when you prepare for the fall. We’re doing that, but five times as much,” Dunn said. It will be a quick 12-week turnaround time for the renovation. The quintuple-sized Lope Shop opens Aug. 15, a few days before Welcome Week begins Aug. 20.